This weekend sees a mixture of Cup ties and League matches scheduled to be played if weather conditions allow. On Friday night at Palmerston Park Heston Rovers play hosts to neighbours Lochar Thistle in a Cree Lodge second round tie which could go either way. This match could well take more than the regulation 90 minutes to decide what team progresses to the semi-final stages of this particular competition although Heston with home advantage will be slight favourites to do so. 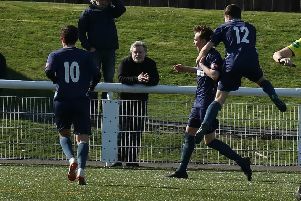 On Saturday Creetown entertain St Cuthbert Wanderers at Castle Cary Park in the same cup competition and although the Ferrytoon side are enjoying a good season Saints may just have too much firepower for them on this occasion. The same day there is a Challenge Cup second round cup tie being played at Garries Park, Gatehouse where Fleet Star and Nithsdale Wanderers meet for a match the home side will be considered favourites having beaten Nithsdale on their own ground last Saturday in a Cree Lodge Cup tie by the odd goal in seven. This is another match though that could go close and extra time could be necessary to separate the teams. There are three South of Scotland League matches due to be played with present leaders Edusport Academy travelling to play last seasons champions Wigtown and Bladnoch at Trammondford Park. The home side have failed this season so far to produce their very good form of the past two seasons and the visitors are expected to enhance their points tally following this encounter. There is an Annandale clash at Moffat where Uppers have Mids as their visitors for a match the Lockerbie side will start as favourites in what should be an exciting encounter while Abbey Vale should manage to overcome the bottom placed Dumfries YMCA in their match at Dumfries High School.